I love taking US Highway 301 on rare drives from North to South Florida. Highway 301 is a snapshot of small town Florida, where decaying Mid Century Modern souvenir shops and fruit stands were erected during the glory days of 1950s road tripping, like a Tacky Tourist Florida post card. 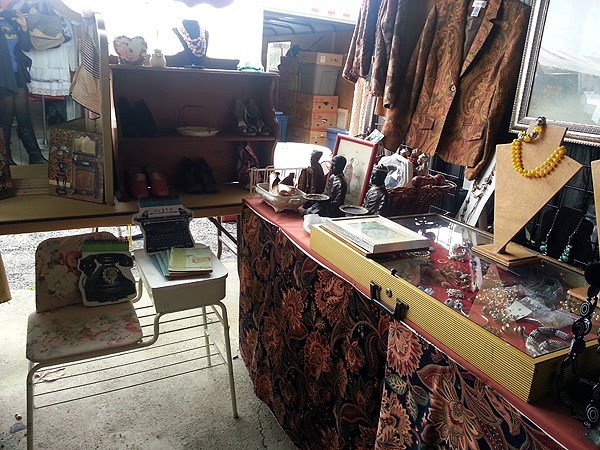 There are also rustic trailer yard sales and thrift shop stops along the way. I am definitely going to make a project out of beautifully documenting every single one of these fascinating stands and junk stops. 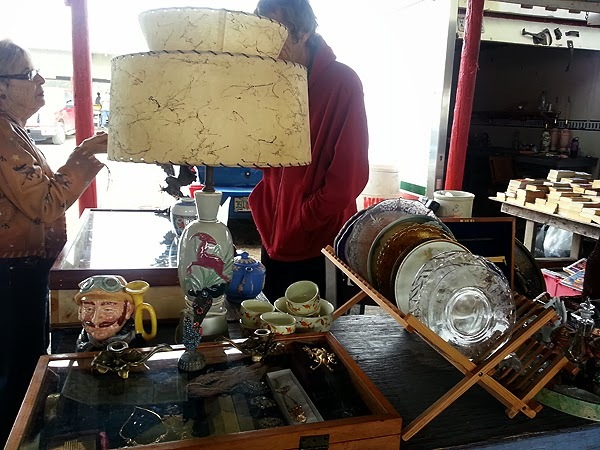 The past Sunday my mom and I made a random journey to the most epic one, the famous Waldo Flea Market. 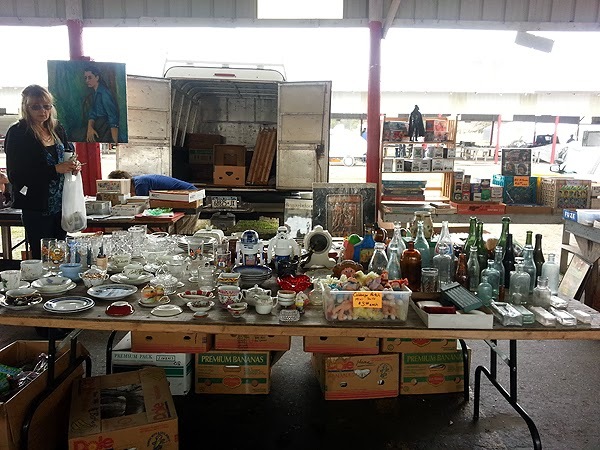 Mixed in with straight-up Sanford and Son style junk displays (which I also LOVE, don't get me wrong) where some vendors with all the beautiful Mid Century Modern I seek I wanted that amazing lamp shade/lamp but it was $60ish. He had great stuff. I also throughly enjoyed exotic animal galore. If you're wondering why this Husky is so large and brown-eyed, it's because it's not a Husky but a WOLF. She was a gentle and playful. Edit: I don't advise having a wolf for a pet at all what-so-ever. Just letting it be known. 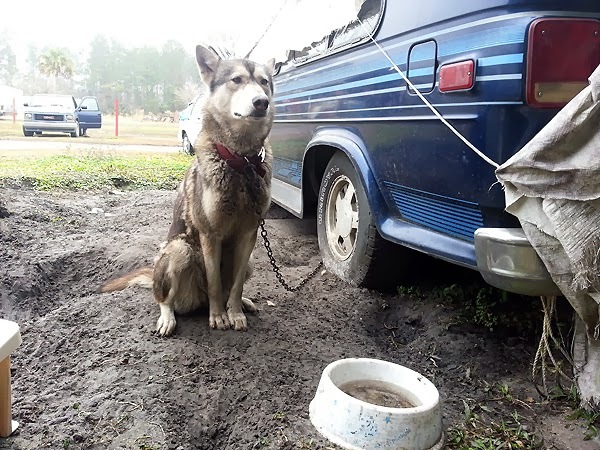 Nor do I celebrate the treatment of this wolf as a chained pet. 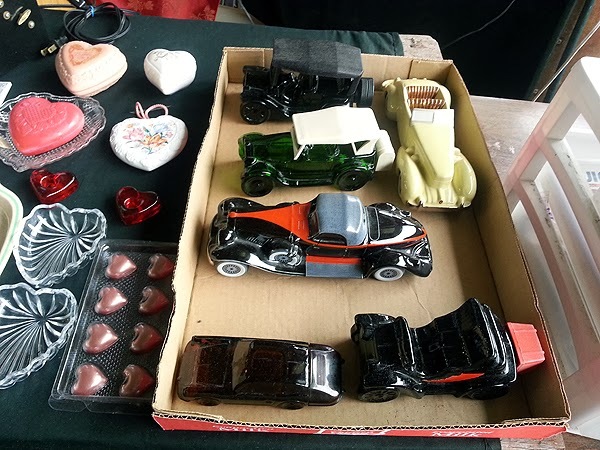 Simply reporting on what I saw while flea market shopping. 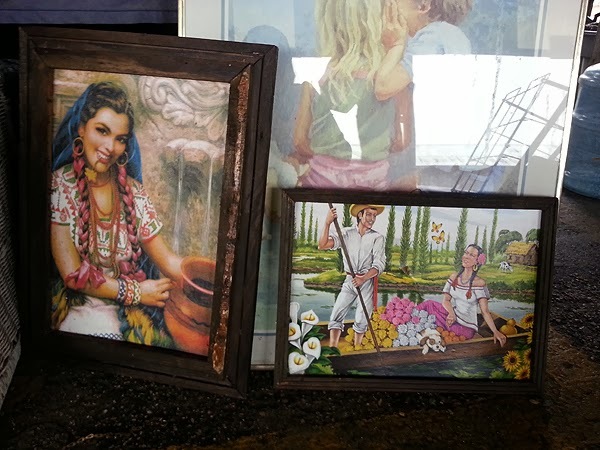 Beside wolfie where some Hispanic-style paintings that resonated with mom and I but they were too damaged. My mom's got a nice collection of Mexican/Puerto Rican art in her kitchen. Had a nice chat with this guy about profitable estates he's bought-out in New York and pristine vintage he's' sold off for the big bucks. He had a lot of pop culture toys I wanted but didn't take a risk on with little knowledge on what the pieces sold for. Inspires me to take more risks and hunt at more estate sales. I love Avon Decanters but I leave them behind now, slow sellers. This guy had the biggest collection I'd ever seen in one place. In retrospect should have looked more at the gun one. I do always sell those. This guy had two very beautifully staged stalls. We chatted about art/design aesthetic, most vendors at Waldo were so friendly. I wanted to buy several unique mod items from but didn't risk it. Maybe next time. The ones I really wanted were all in the $20-$40 range but were the type of conversation pieces that sell for much more. These rocks are likely vintage, no? The child-me would have died for this set-up. I loved collecting rocks. This antique Microscope set's interior was messy but wow, glorious thing to behold. More stuff more my past amateur scientist to drool over. Gorgeous design on the label and interesting color choice, too. More beguiling 50s-60s breakables to behold. Great collection, all expensive. 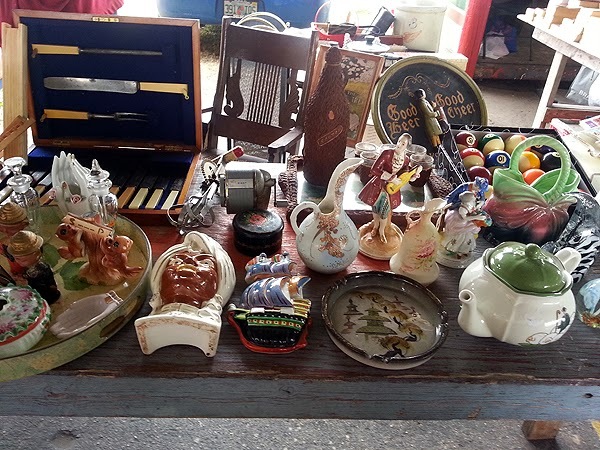 A close-up of estate-sale-guy's wares, he had so much to behold! Lots of random bits from his buying adventures. I enjoyed these deliciously gaudy handmade/painted cement pieces, she had great prices on them too and I came home with one you'll see next week. I wish I had photos to show of the outside right now, still trying to retrieve shots of this adventure from my phone. (Expect a follow-up!) but here's an example of the junky areas. 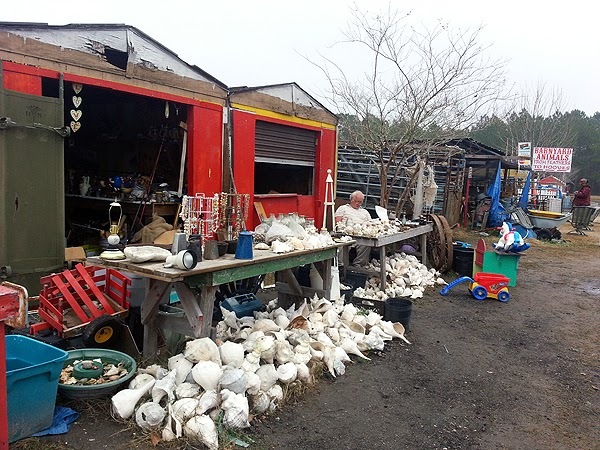 Many piles of junk, many goats, chickens, and bunnies to pet. But my favorite was this ring tailed lemur, bred in South Florida as a pet. Very well behaved, the body fur was soft like a chinchilla. Such an beautiful creature! I've seen a bush baby and huge exotic birds while yard saling and flea marketing but the lemur was the most enchanting exotic creature sighting for me yet. Edit: While it's legal to have a ring-tailed lemur and other exotics as a pet in Florida if you go through the expense/time to earn a wildlife license it's difficult on both the owner and animal to have an exotic pet. Not advised. Except maybe this bobcat! Just kidding, he's shed his mortal coil. How dare you tell me not to touch, sign, that's all I want to do looking at this regal hyde. The dream! 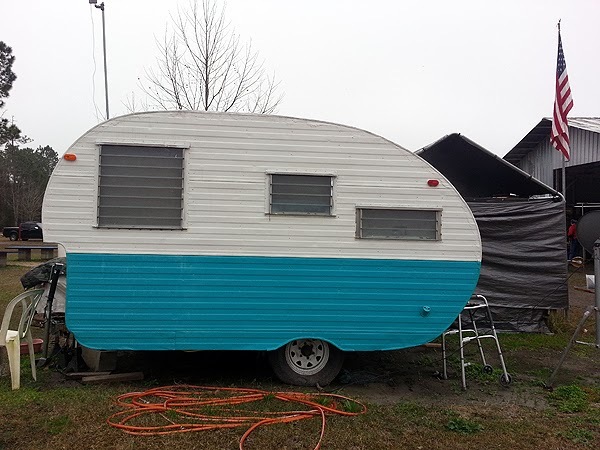 Seems like everyone wants a retro trailer for a pop-up shop these days. You can sense the history of this place, the outdoor vendor's stalls had a look of being there (and decaying) for a LONG TIME. 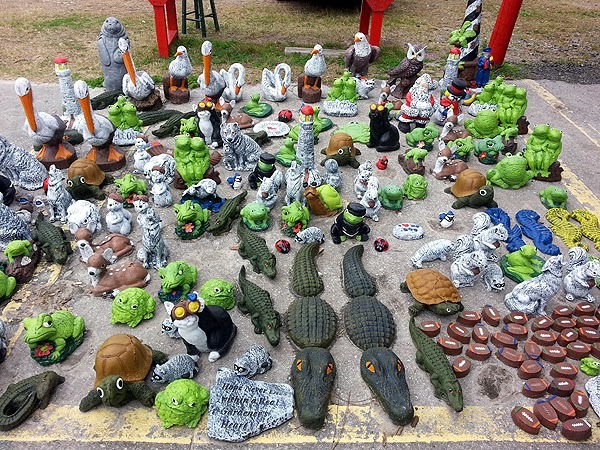 A nice example of Southern junking culture. In the end I came home with a lot of glorious retro goodies and have made a tidy profit selling some of the pieces from my trip already. Will definitely make my way back and try to fit in more travel trips. And more hunting in general. My inventory needs fresh blood. I always say "the junkier, the better"! 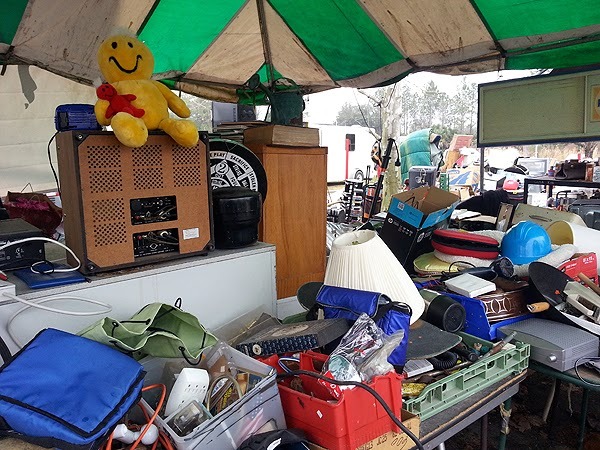 Usually, If I go to a thrift store, or a flea market, where stuff is just piled up with no organization, I will dig around and find something good! The stuff that is neatly organized usually has retail pricing. 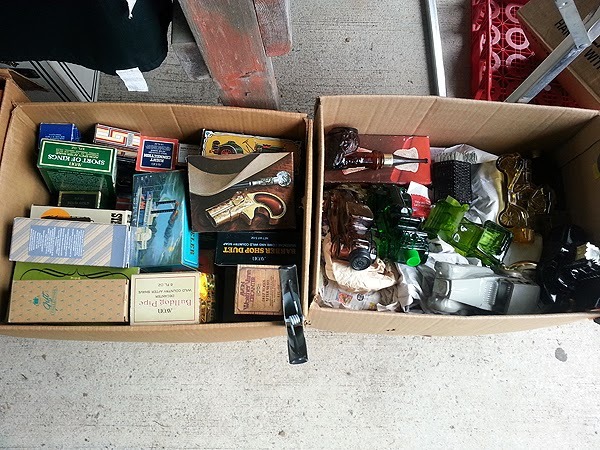 The stuff that is in random piles...those sellers don't know or care about the value, they just want to get rid of it...cheap! I saw some piles in your photos that I really want to dig into! Cant wait to see what you did buy! Yeah that's what I always say, the tidier the more higher the price, but I always try anyway. You never know. One of the super junky piles out there had high prices. More photos to come on this flea market, there was SO MUCH and I'm trying to get the photos off my phone still. I would have snatched up that awesome little telephone table!! I sold my last one like that but his was too expensive for me to buy. I got lucky and found one cheap once, but had to sell it cheap too! Boo :P Furniture doesn't move fast enough for me, I'm impatient and space-deprived. 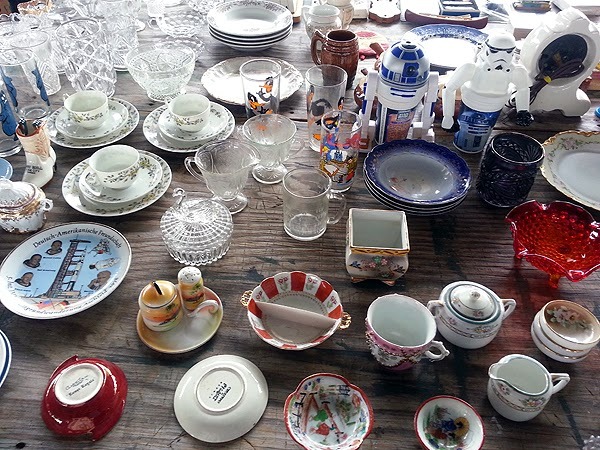 I love how in the midst of antique bottles and plates, I spy an R2D2 and Stormtrooper! Yeah, I liked those too, he had some great toys. I have a metric ton of these to play catch-up on. Not super creatively satisfying posts for me since it's like a day-at-work for me but the response is fun. I would have had to buy the beautiful hispanic lady. I would happily look at her every single day! What a wonderful and informative trip for you. She was a very pretty piece indeed! I've been to Waldos once, years ago. I can't remember if we bought anything. It's an awesome stop even for browsers. I live near the Waldo Flea Market, It used to have so many more vendors. You never know what you will find there. The animals are one of my favorite parts too. So many different types for sale and so many people bring their dogs. The flea market has been trying to have theme weekends. You can follow them on facebook too. I may be visiting more. I want to check out all the delicious vegan food in Gainesville while I'm out there too! Love the lamp shade and looking forward to seeing which pieces you bought. Plenty of beauties to show off next week for sure. The bobcat makes me sad though. I've heard some terrible stories about how some of those taxidermied animals come to be. Oh, and I probably would have bought a cement squirrel, as well. Wish I was thrifting in Florida right now. Here? 6 inches of snow and an icestorm!! The microscope was over $20 or I'd have loved to bring the gorgeous piece home. 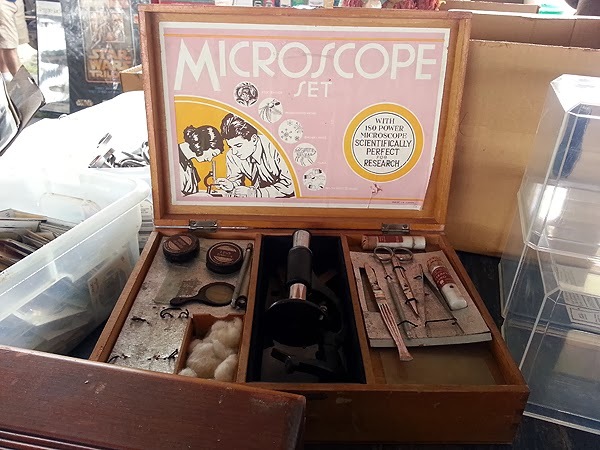 I have fond memories of our childhood microscope. Can't imagine snowstorms and ice! I want to take a trip to play in snow sometime but damn. Not that. I would have bought a conch shell from the guy in the last photo. I have them all around the house, both inside and outside. We went to an estate sale yesterday near the AL/FL border (near Pensacola). The house was packed. Packed!!! But the prices were stupid high and I was mad because dealers were buying a lot of stuff at those high prices. Now I know why antiques cost so much around here. 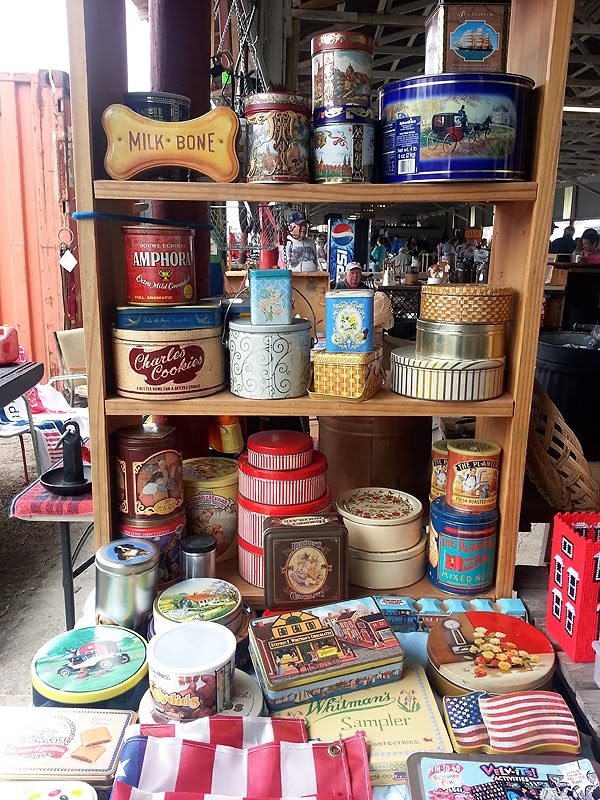 I used to buy really cool old stuff up in the northeast, but I can't touch it down here. Too much competition from dealers. I want your batman shirt! :) That is you in the mirror, yes? Can't wait to see what you got! And it disturbs me no end to see an endangered primate being offered for sale as a pet, no matter how soft its fur is. 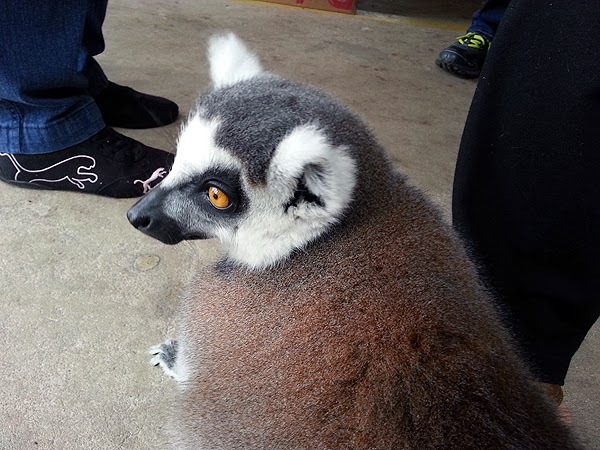 Here's a very interesting article by a vet who treated a lemur's broken paw. It gently mentions the legal and practical ramifications of trying to keep a lemur as a pet. Van, I've been reading and enjoying your blog for a long time, and I love what you do, and the great enthusiasm with which you tackle all of your endeavors. But the wolf (wolfdog?) and lemur photos just stopped me cold, and I had to say something. 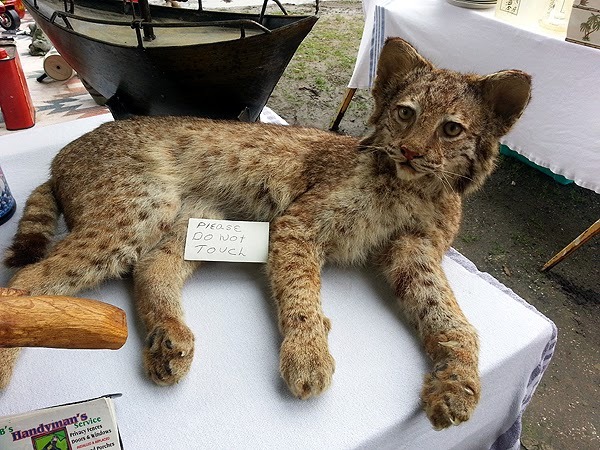 Please accept this comment in the spirit in which it was written, merely as a friendly attempt to shed a little light on the subject of exotic animal sales at flea markets. Sorry for the interruption - Now back to your lovely blog! No problem, I had discussions with vegan friends I work with at the kitchen about what I saw and how it's not right. I wouldn't buy a wolf or lemur or any wild animal but I still can't help but take pet and touch one, take photos, and share when I see something exotic. I have been to busy listening to music on my phone to photograph anything. Although, there is this small independent thrift. It has 4-6 women working in it at any given time. It's the size of a corner store. They follow everybody. You really want me to believe that you are looking at that t-shirt at the end of the rack for 30 seconds that has been sitting there ALL day? Anyways, point was: I wanted to photograph something the other day, but yeah, she was leaning over me like a hawk. $8 for an Old Navy t-shirt, stretched out & faded from washing. Can't you get 2 Old Navy shirts for that price new? It's a weird store. I got 2 vintage shirts, unworn for $1 a piece. I am not allowed to have any taxidermy. That is where my BF puts his foot down. There's an indie thrift store near me that's like that, they have a huge screen showing their camera's live footage above the register, too. I have gotten "in trouble" for poking my camera around, with my phone it's a little less intimidating. One lady got mad I'd "use the photos I just took to sell her stuff online" and even threatened to break my camera so I turned my camera around to show her deleting them and she was happy. 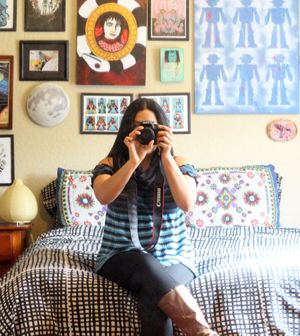 Now I always ask permission first when I use my SLR like a creeper, haha. I guess I'm too "in the zone" hunting to let anyone's sour attitudes bother me anymore. 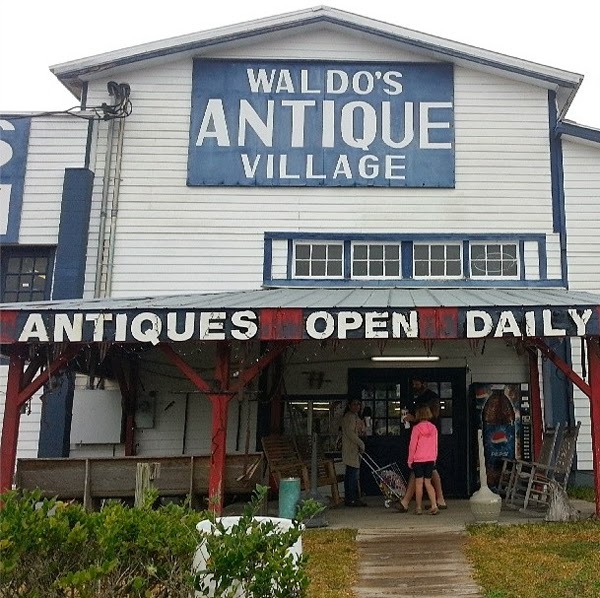 Very interesting place, this Waldo flea market. I guess you learn about different regions of the US by visiting the flea markets and seeing how and what they sell. Me, depending on the price, I would have picked up the microscope. I've had a lot of luck selling microscopes and microscope-related paraphernalia, including glass slides. Hmm...good to know. Thanks for the tip! Maybe it'll be waiting there for me next time. I honestly didn't know you could keep lemurs as pets. In Florida it's legal but you have a wildlife license. It's really trendy to keep undomesticated pets but like Nogrinnin above has shared, morally wrong. And difficult for the owner to have a wild, untrained animal destroying the house and marking it with pee/crap everywhere. 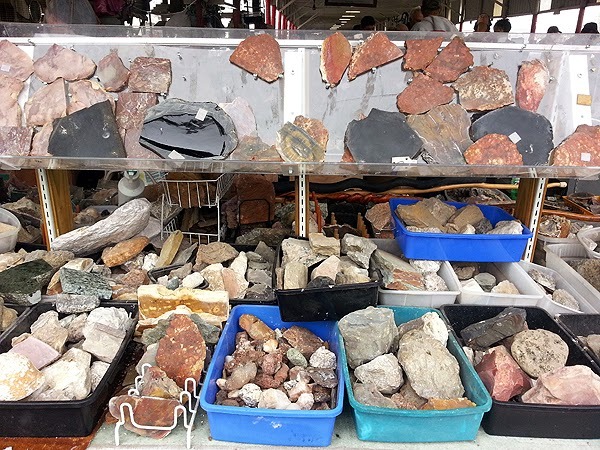 It wasn't an individual, it was a group of dealers that had a HUGE display of various rocks, crystals, fossils, shark's teeth, etc. My pic failed to show it was a pretty pro set-up, someone was in the back polishing stone with a machine. The kid-me would have loved to buy some of those lovely stones, they make great collections/decor. Omg- nirvana! I foresee a road trip in my future! Loads of vintage for sure. Did you get a chance to visit Ms. Mattie's World Famous Funnel Cakes? Great food, Great service! Nope. Sounds yummy but I can't eat stuff like that.